An automatic cleaning station is definitely nice to have as it takes care of cleaning and lubricating your electric shaver. 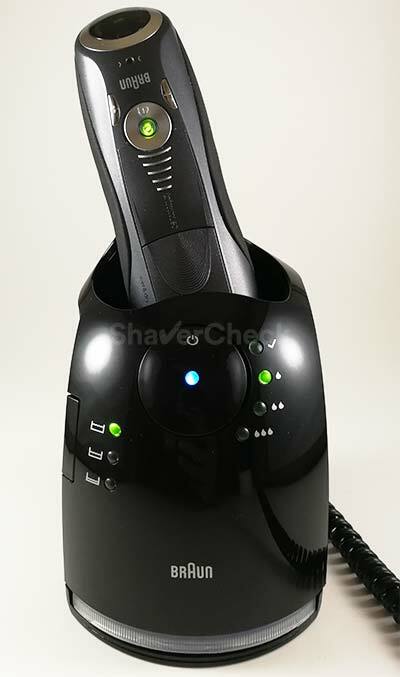 You could of course do these operations yourself, but it’s a lot more convenient to simply toss the shaver into the station and have it thoroughly cleaned and completely charged, ready for your next shave. And with Braun shavers that use their trademark cassettes that integrate the blades and foils into a single enclosed piece, a cleaning station is genuinely useful. However, using a Braun station also implies constantly buying new Clean & Renew cartridges. And the costs of buying new refills can really add up. Luckily, there are a few cost-effective alternatives out there, ranging from DIY solutions to third-party, ready-made refills. 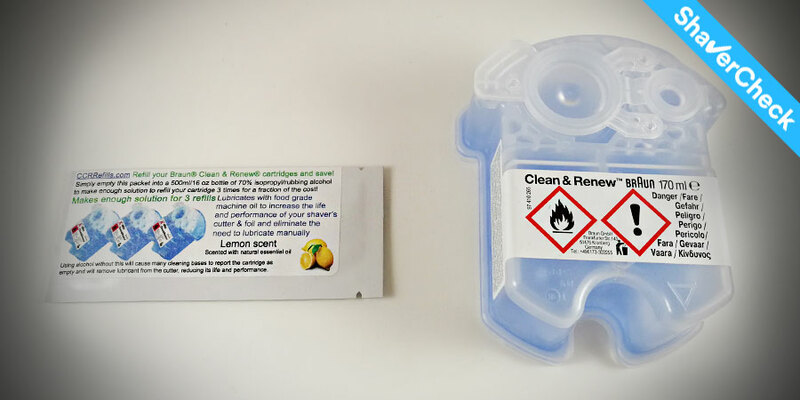 In this article we’ll focus on the latter and check out one of the more popular products of this type, the refill packets from CCRRefills.com. They promise results that are at least as good as the OEM cartridges for just a fraction of the price, so we’ll see just how well they work and also how they compare to Braun’s own cleaning solution. First of all, I have to mention that I am not sponsored or endorsed in any way by the manufacturer of these refills. I bought the product myself to use it with my Braun cleaning stations and thought it would be useful to share my experience. With that said, you probably know that you can also make your own cleaning solution using only basic ingredients by reverse engineering Braun’s cleaning solution. However, at least from a practical standpoint, the use of ready-made concentrate is preferable. And that’s the main advantage of these packets: convenience. They’re easy to purchase, prepare and store. The cost per refill is extremely reasonable and you’ll have the peace of mind of using a product that was thoroughly tested and is backed by hundreds of user reviews, pretty much all of them positive. In the case of a homemade solution, apart from the difficulty of getting all the ingredients, there’s the tricky problem of getting the proportions just right. This is important in order for the solution to work properly and the station can even show an empty cartridge reading if the electrical conductivity of the fluid is not within certain parameters. While there are ways to get around this like adding more water to your mix, I think I would actually prefer using the concentrate packets that only require mixing with 500ml of 70% to 100% alcohol and avoid all the hassle. Yes, making your own solution would likely bring down the costs down even more, but again, I think they are worth it for the completely hassle-free experience. I am not by any means suggesting that you shouldn’t follow the other approach; in fact, I will be sharing a detailed guide on that as well as soon as I have perfected and tested the recipe thoroughly. But for now, we’ll focus on this ready-made solution from CCRRefills. Let’s now get to actually putting together our alternative Braun formula. As you’re about to see, it’s extremely easy to do and you can’t really do anything wrong. The concentrated solution comes in these small packets that can be bought in bundles of 2, 3, 5, 10 or 25 pieces. I highly recommend getting at least a pack of 2 as the cost per packet will be significantly lower and you’ll be needing them anyway. Also, they take up virtually no storage space. 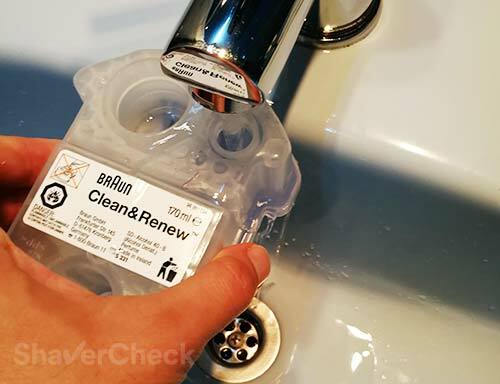 A single packet will be enough to refill a Braun cartridge 3 times, so buying a 10 pack for example will allow you to refill a cartridge 30 times for approximately $1 per refill. That’s fantastic value for money. The refills come in 5 flavors: Lime, Lemon, Orange, Peppermint and unscented. I went with the Lemon scent just to compare it to the original Braun CCR solution. Here’s a step by step guide on how to make the solution. Empty the remaining content of a used Braun cartridge. Make sure to remove the liquid through the small opening as the large one contains a very fine mesh filter and the hair clippings won’t get through. We want to remove as many of them as we can. Fill the container with tap water through the small hole, put the plastic cap back on firmly and shake it vigorously. Empty the content again through the small orifice. Repeat this step at least 5 times in order to remove as much debris as possible. Don’t worry if you cannot get all of the hairs out, they’re very difficult to remove as they’ll stick to the walls of the cartridge. You can use some alcohol instead of water to rinse the cartridge as that’ll loosen the hairs better, but again, don’t stress about it. You can see in the picture below my result after rinsing the container for 10 minutes. Trust me, it’s good enough despite not looking particularly clean. If you can do a better job than me, great. Just make sure to give the cartridge a good shake and remove all the water before getting to the next step. You can use either Isopropyl or Ethanol. I used Isopropyl alcohol as that’s all I could find at a nearby store. Since the concentration was 100%, I used some distilled water to bring it down to somewhere between 70% and 80%. I could have very well used it as it was without any issues, but I wanted to make this test as relevant as possible. And since the majority will be using 70% alcohol as that’s the most common variation, I thought I should too. Cut the top part of the packet with scissors and pour the whole content over 500ml (16 oz) alcohol (I used a 1L clean plastic bottle). Shake the bottle to mix the content evenly. As mentioned previously, I went with the Lemon variation and it smells very similar to Braun’s original refills. The manufacturer even includes a sticker so you won’t confuse the bottle with something else like plain alcohol. You should shake the bottle every time before refilling your cartridge. The 500 ml/16 oz of cleaning solution will be enough to refill a cartridge 3 times. Pour the solution through the small hole and fill the container to approximately ¼” from the top. 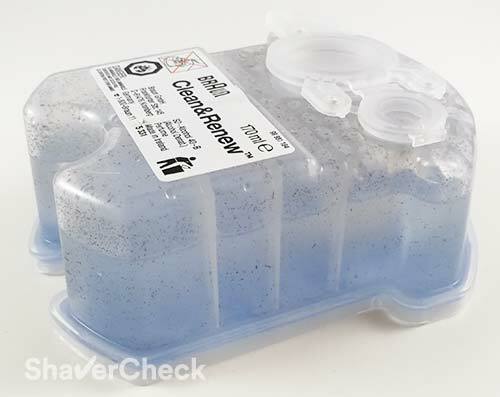 Failing to do so will result in the solution overflowing the container during the cleaning process and prevent the shaver from drying completely. The ingredients of these concentrated refills are very simple (and drastically different from Braun’s original solution): food grade machine oil, essential oil and water. Again, if you can get these ingredients and you’re willing to play around with the proportions, I see no reason why you couldn’t make your own solution for even less money. Food grade machine oil is basically a highly refined mineral oil that’s safe to use on equipment that comes into contact with food. The use of it in these refills is clearly for the purpose of lubricating the blades. The original Braun solution didn’t have any oil in it and I guess it solely relied upon the lubricating properties of Limonen or Citral. I’ve been using the CCRRefills solution exclusively for one month before writing this review. I cleaned my Series 5, 7 and 9 with it and never switched to an original cartridge during this whole testing period. I’m glad to say that the results are GREAT. Apart from the fragrance not being as potent as the one in Braun’s refills, I haven’t found any differences whatsoever. The Braun Series 7 during the automatic cleaning process. The station signals a full cartridge. None of the stations ever signaled an empty cartridge and the cleaning process always went smoothly, just as it would when using an OEM refill cartridge. My shavers were always perfectly clean and lubricated; I haven’t noticed anything unusual and they performed great, just like before. I realize that one month is probably not enough to draw a final conclusion, but so far the results are really impressive. I will update this post as time passes in case I notice anything significant. I can strongly recommend these refills as a significantly more cost-effective alternative to Braun’s cleaning solution. 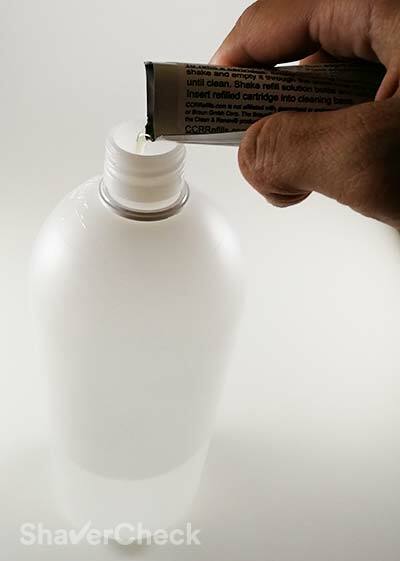 Rubbing alcohol is dirt cheap and widely available and the overall cost of a refill obtained in this manner will be a lot lower compared to the original. So if you were on the fence whether to buy a Braun shaver that comes with a cleaning station because that would bump up your costs of ownership, this truly is a viable alternative that will drastically reduce your expenses. And you can lower them even more with just 3 easy steps that will make the cleaning solution last a lot longer. 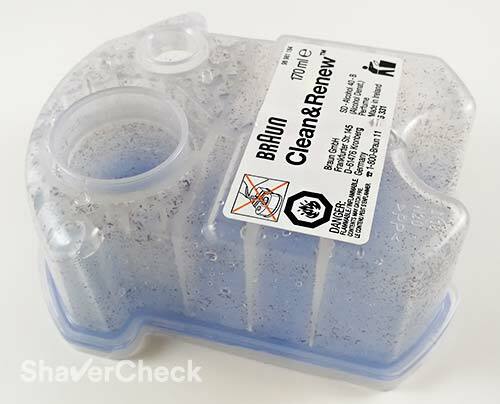 From now on you would only need to buy original Braun CCR cartridges when the filter on yours becomes clogged with dirt or gets damaged. But from my experience it will take a lot of refilling before that happens. If you have further questions or would like to share your experience with these refills or your own homemade solution, make sure to comment in the section below. A word of caution. Out of curiosity, I made my own research about this and found warnings about using Isopropyl alcohol because of stronger solvent properties compared to ethyl alcohol. Isopropyl alcohol could potentially dissolve the shavers plastics and gaskets, so I would not recommend using anything but ethyl alcohol (same as in Braun’s OEM cleaning fluid). Thank you for the heads-up. Braun actually uses either Isopropyl alcohol or Ethanol in their cleaning fluid as shown in this data sheet of the Isopropyl variation. On some cartridges it will even be listed explicitly on the label (propan-2-ol). The ethanol-based fluid uses a special denatured form (SD – Alcohol 40 – B). I’ve also seen Braun cartridges that don’t list the type of alcohol at all, so it can be either Isopropanol or Ethanol. 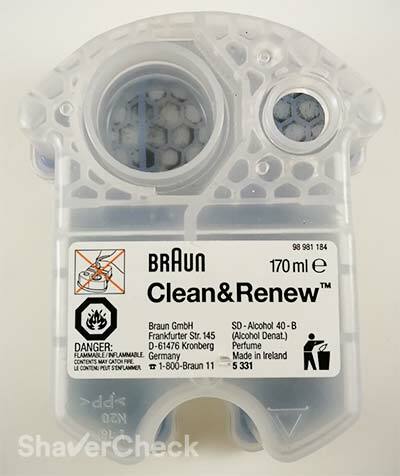 I am aware of the claim that Isopropyl alcohol can be more aggressive to plastic and rubber surfaces, but since Braun uses it I thought that it won’t be a problem. However, I think I will update the article and post a warning about it just to be extra cautious. I was not aware that Braun uses both types of alcohols for their cleaning fluids. Are those for different series or can the same shaver series have either Isopropyl alcohol or Ethanol? I’m asking because different series could be made of different materials. Either way, Braun would happily sell you a new shaver head or a completely new shaver, so I don’t think they care which type of alcohol you use. Nope, there are no cartridges intended to be used with a specific shaver model. They’re all the same according to Braun. First I would like to thank you for the awesome detailed information you provide on this site. I bought the Braun 9295cc as it is available in my country. The head is indeed really hard to clean manually. But checking what the Cleaning Station do I think I found a solution. So I use a water pulverizer used to spray plants. I remove the head from the machine, brush the machine to remove the dirt and then spray the head with the pulverizer. I adjust the spray pulverizer to be a concentrated water jet. It’s pretty effective. After removing all the dirt I use soap and water to finish cleaning. Thank you for your comment, I truly appreciate it. That’s a great workaround and I’m sure it will be useful to Series 9 solo owners — or to those that don’t use the cleaning station. I do think that after some time it would be beneficial to also run your shaver through an automatic cleaning cycle. I’ve had many Braun shavers throughout the years and no matter how rigorous I was with cleaning the shaver, after a few months I would start to see some dirt buildups inside the cassette that I simply couldn’t remove. And also dried lather/shaving cream is really a pain to clean. This is a list of all the ingredients in each cartridge. Thank you for providing the link, I really appreciate it. About cleaning: after shaving I release the catridge and flush it (and the machine’s socket) under warm water. After that I shake off the water a bit and I put it into the cleaning station to clean. Is this a proper way? Or should I skip the flushing? Thank you very much for your quality content on this site! I personally don’t wash the cassette of my Series 7 before an automatic cleaning cycle. I simply remove it from the shaver, gently tap the plastic part on the sink to remove most of the hair strands, then snap it back on the shaver and let the station do the work. Rinsing the shaver and the cassette with tap water will remove most of the hairs, meaning fewer will end up in the cleaning cartridge, which is a good thing. So if you’re willing to do it, it definitely won’t hurt. Just make sure to shake off most of the water, maybe even pat the shaver/cassette with a clean towel or paper tissue. You’ll want them to be as dry as possible before using the station. I think it’s odd we aren’t mentioning what appears to be the main ingredient here- “SD alcohol 40”. Basically 40% ethanol. Do you know an easily available 40% alcohol solution with little else? Vodka. The fact that vodka is not denatured should make no difference- denaturing is just a process that makes it toxic to drink by adding a teeny tiny amount of methanol so they don’t have to pay liquor taxes. Given how cheap cheap vodka can be ($5-$10 for 750 ml depending where you are), seems like it’s an easy pick-up. It may be that it doesn’t really matter and just isopropyl is fine. The 40 in SD – Alcohol 40 – B (the type used by Braun) doesn’t have anything to do with the concentration. It’s just a code for the denaturant that’s being used, like 39-C, 38-B and so on. So that’s definitely not just 40% ethanol. According to Braun’s data sheet, they use either ethanol or isopropyl with a concentration between 60% and 100% (they do not state the exact concentration). I haven’t tried it, but 40% alcohol is probably too low and there’s a high chance the station won’t work and signal an empty cartridge. There is a known issue with the Series 7 in that after around two years of use in conjunction with Braun’s Clean & Charge stations, the plastic beneath the head starts to flake. Maybe this is because Braun sometime deploy Isopropyl alcohol rather than the rather less aggressive ethyl alcohol. I’ll erring on the side of caution and continue to use ethanol in my concoctions. I have previously had good results using ethanol-based ‘Surgical Spirit’ which has castor oil in-situ. I wonder if the variance of usage of propanol vs ethanol is down to statutory regulations in the nations where the cleaning cartridges are manufactured. That is correct, the paint chipping on the Series 7 is a well-known problem, acknowledged by Braun, but never fixed or addressed in any manner. In the datasheet of the CCR solution it is indeed specified either isopropanol or ethanol. At this moment I cannot say with certainty whether the use of one or the other will increase the likeliness of the paint getting damaged, but it is a legitimate concern and it’s probably best to opt for ethyl alcohol just to be on the safe side. I’ve only come across Braun cleaning cartridges manufactured in Ireland and some of them had the type of alcohol explicitly written on the label (SD – Alcohol 40 – B), while others didn’t have any information in this regard. So I guess it could be either of them. And added a 10ml sachet of lemon oil and filled the cartridge up to 170ml? Since you’ve mentioned the fan, I suppose your shaver is a Series 9. From what I can tell, it appears that the station may be clogged. The solution should work exactly like Braun’s original product and after a cleaning and drying cycle, the shaver should be clean and dry. If you’ve followed the instructions precisely, the cleaning solution is definitely not the culprit. Try cleaning the drain hole of the station using a toothpick. thank you for helpful instructions how to save some money and do not be reliant for buying those overpriced original Braun cartridges. But I did some research and I have some concerns when it comes to using casual denatured alcohol for electric shaver cleansing. Difference between SD – Alcohol 40 – B which Braun is using and casual denatured alcohol is that Braun’s one is good to use in cosmetics and can come in touch with the skin. Denatured alcohol which you buy in every drugstore is full of toxic substances. The problem is after each shaving you get small abrasions on your skin allowing any leftover denaturing ingredients to seep in and reach the blood stream. Does alcohol evaporate completely with all residues ? is it safe to use and is it worth to risk it in order to save money ? I would like to know your opinion . Thank you for your comment. That is actually an excellent question. It’s true that in cosmetic grade alcohols like the SD 40 – B there are only a few denaturants allowed to be used. The rubbing alcohol (ethanol or isopropyl) that you buy from a drugstore is also denatured and the denaturing agents can and are most likely different than the ones used in the SD – Alcohol 40 – B. However, I wouldn’t worry too much about this not being safe for cleaning an electric shaver. For example, rubbing alcohol is used as an antiseptic agent and can be applied to the skin and even on opened wounds. Also, when the alcohol evaporates from the shaving head, any substances that are left behind are most likely in quantities so small that they couldn’t cause any harm. You could use SD – Alcohol 40 – B if you’re still in doubt, but I don’t know how easy it is to get (I haven’t been able to buy some in small quantities). I thought that rubbing alcohol dedicated for medical purposes like treating open wounds is different in content. Is it the same like denatured technical alcohol ? I have been searching for SD – Alcohol 40 – B in my country but without success. I found grain alcohol called Everclear without toxic substances but it costs almost 20 bucks per 1 liter , so it would not make sense preparing your own solution instead of buying original cartridges when you take in to account you have to buy essential oil and clean up cartridge each time. I would not care about this ,but if you are shaving on daily basis like I do and if in theoretic way only even small amount of toxins get to your body during one shaving , it could lead to some health problems as years are passing by. I will try to do more research and will get back if I found some trustworthy source on this matter. You are welcome, Tomas. I think my previous comment wasn’t exactly clear, so I’ll try to be more concise. Rubbing alcohol, which is either ethanol or isopropyl based, is a type of denatured alcohol. And yes, the generic rubbing alcohol that you buy from any drugstore is the one used for medical purposes. There are other types of denatured alcohols, that contain different denaturants and other chemicals (including methanol), that are used as solvents and so on (and yes, those are pretty nasty). But we’re not talking about those here and regular rubbing alcohol should, by all means, be safe to use as the base for your cleaning solution. I have found 99,5 % Isopropyl here in paint colors shop only, do not know what is remaining 0,5%,it could be everything. I did not find any isopropyl in drugstore which has information it could be used to disinfect wounds. I found one product in pharmacy called Sterillium dedicated to disinfect hands, costs 13 bucks per liter. some sort of parfum and coloring. Here you can be sure 100% it is safe ,it is 75%( 45 g+30g) ,it has even glycerol as a lubricant ,perfume to suppress odor and nice blue coloring. What do you think, can I use it ? Just purchased Braun 7685cc and ordered the CCR refills. I can get ethanol in 99.5% or 70% and isopropyl alcohol in 70% locally. From what I have read, it appears the ethanol is probably recommended. Does the strength matter? The solution that came with shaver is the ethanol based one from Ireland. And congratulations on a thorough and amazing article on this shaver and its comparison with others. That was quite a project. Thank you for your comment. Yes, ethanol would be the safer choice. I personally use isopropyl alcohol (that’s what I could get at the time) and everything seems fine so far; but given the choice, I think you should opt for ethanol. I will continue using isopropyl alcohol just for testing purposes and see (and report back) if there are any long term problems with it. The concentration doesn’t really matter as long as it’s between those values (70 to 100%). The type 5697 only refers to a Series 7 suitable for wet & dry use and appears on other wet & dry models, not just on the 7865cc. Sorry model is 7865cc. But on the unit itself and the owners manual, it states type 5697. I have found 99 % Isopropyl (1 lt). And i find lemon oil. I use 9 series. My question is how many drops (or ml) oil i must add to 1 lt Isopropyl? I have tried 6 drops to 170 ml, but the cleaner gives error (red / refill) all the time. I had to buy new cartridges of Braun to see if the machine still works. It works fine. I don’t want to make mistake 🙁 Can you help please? I should buy 70 procent? i put too much oil? or less? I don’t think the oil is the problem here, rather the electric conductivity of the solution. This is one of the main reasons why I tend to recommend these ready-made third-party solutions, it can be tricky to get it right and not get a false “cartridge empty” reading. Start by filling the cartridge with approx 140ml of alcohol, then try adding around 4 teaspoons of water to the solution. You may need to add more if the alcohol concentration is still too high and the station sees the cartridge as empty (make sure not to overfill the container). 3 to 4 drops of oil per refill should suffice.